There's nothing dull about our Arabesque rugs, this stunningly coloured modern range of rugs is guaranteed to brighten up the dullest of decors. Oozing in quality, this woollen pile rug shimmers due to the added viscose yarns, if the shimmer doesn't grab your attention then the textured Moroccan pattern sure will. 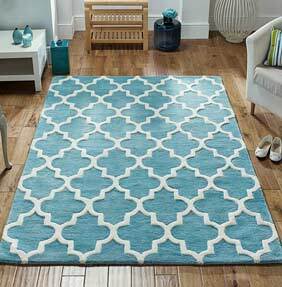 Arabesque rugs look just at home in either a contemporary living space or a more traditionally themed decor. The perfect addition to the home.